Exotic and sweet, buttery smooth to the touch, beautiful against natural skin tones. The fruit to the angels with its pear shaped diamond as a sparkling stem. 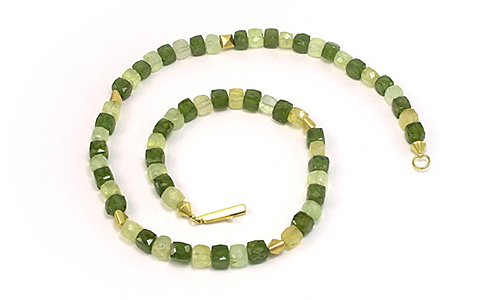 Chrysoprase, diamond 0.14 ct flawless F colour, 18 karat white gold presented with 20 inch wheat chain. Illuminating opulence, to never feel alone again. Sizable beryl crystals from aquamarine to heliodor spill their protective energy. Feel the cool of the gems and the warmth of these oversized natural pearls caressing your skin. Beryll crystals, freshwater pearls, white gold 18 karat of a high polish. Mysterious like a big moon hovering off a misty horizon! Ask this necklace for a secret. Where have these pearls lived? Where were those moonstones unearthed? Let the mystery live in your days! 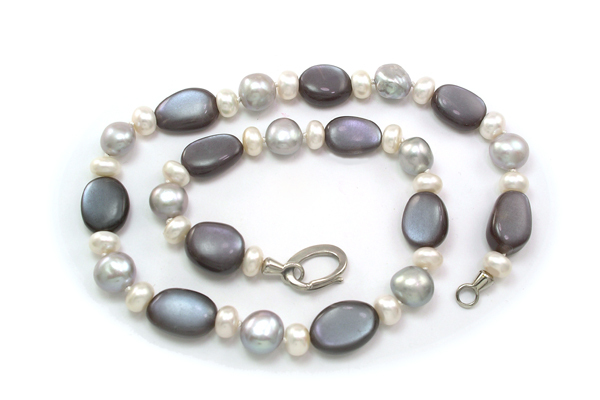 Indian gray Moonstone, white and gray Freshwater Pearls. 18 karat polished Martinus white golden tendril clasp. A cascade of light and a luminous streak of abundance. Shape, size and proportion became the task of this sensuous composition. 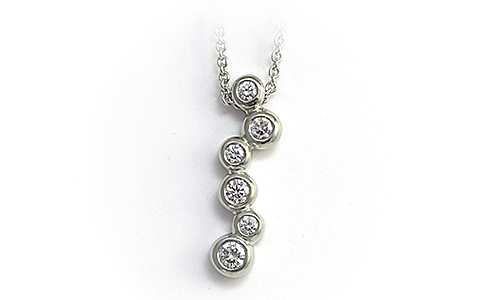 Like a cascade in an orchestra, this pendant will enliven your world. 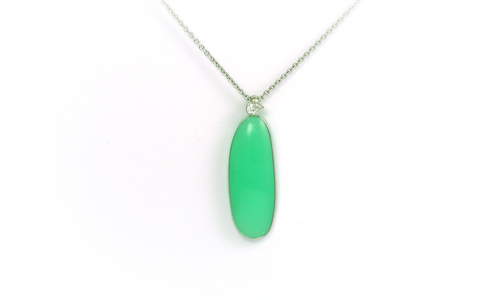 Gentle rounded surfaces on an easy floating chain make for its joyful feeling on your skin. 18 karat white gold, diamonds 0.60ct. Water lilies spread across the surface, like jewels of the pond. Golden leaves will float gently with your movements. The diamond blossoms sparkle their magic at the skies. Catch the light. 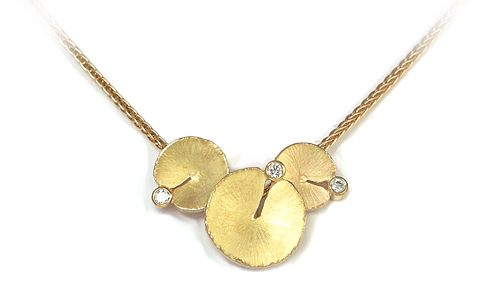 3 pure Diamonds F-vs 0.06ct Matted leaves in 18 karat yellow gold will follow with body motion. Flavoured with sweet drops of honeycomb Citrine, silky freshwater pearls are the peaceful balance of this pampered enjoyment. 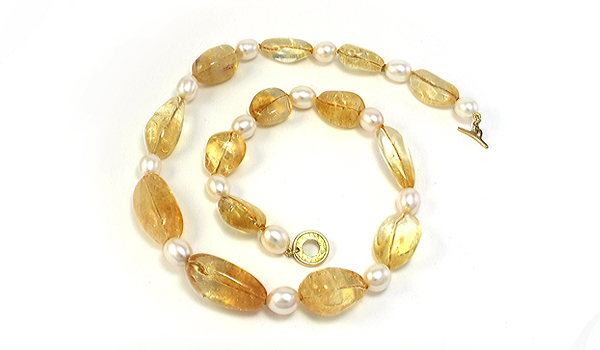 Citrine Freshwater pearls, 18 karat gold. 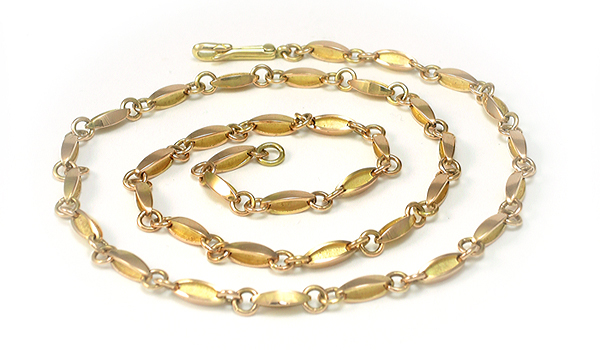 Capture the shimmering waves of a barley field in this hand-crafted chain of rose-gold seeds. Make a promise, have your bond strengthened by the comforting cycle of the seasons. 18 karat rose gold saturated with yellow ancient gilding technique. Nefertiti means "the beautiful one has arrived". Inspired by ancient Egyptian jewellery, a new design has arrived here. Its' silky glow of matted gold and rich natural turquoise is secured for all time by an equally stunning clasp. Wouldn't she approve? 18 karat yellow gold 43g, natural turquoise. 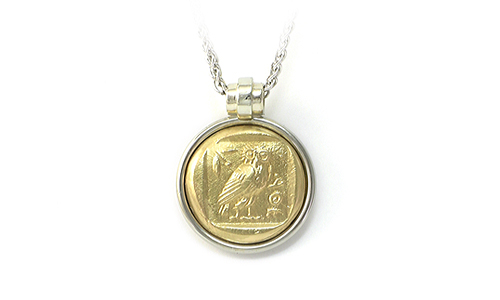 According to Greek mythology, the owl is Athena’s mascot. At times Athena was said to take the form of an owl. This little owl pendant warms the heart and lifts your spirits in 18 karat yellow and white gold. Tastefully sophisticated. Carefree as a summer’s day and brilliant as ancient Crete under clear Mediterranean skies. 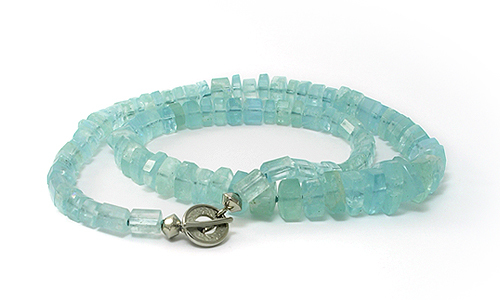 The pure blue aquamarine crystals form a row of relating treasures. Perfect for every day, yet elegant for occasions. Worn at ease with our Martinus white gold toggle clasp. Aquatrillion 18 karat white gold. 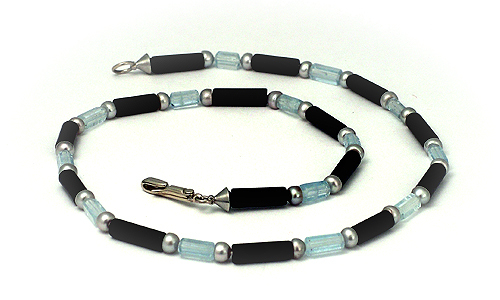 The elegance and contrast of Aquamarine crystal shapes, night black Onyx and silver-gray pearls create sparkle and rhythm. Finished with a Martinus’ Pavo clasp and end fittings in 18 karat white gold. 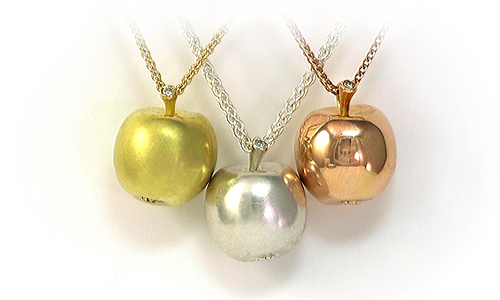 If you can say, “I like who I am” – You likely can say, “My pendant and necklace has to be me”. A pendant like a talisman floating on a caressing chain offers protection and comfort to the touch. Stronger than this, gemstone or pearl necklaces of the right size and length makes you feel complete. Choosing your best colours will set you on top of the world. It’s self esteem that can be felt, even on the skin. 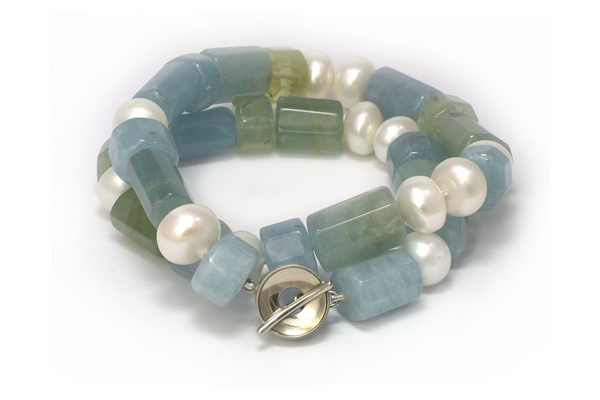 Gemstones and pearls warm up so nicely with our bodies. It’s comfort, it’s strength, it’s how you want to be!